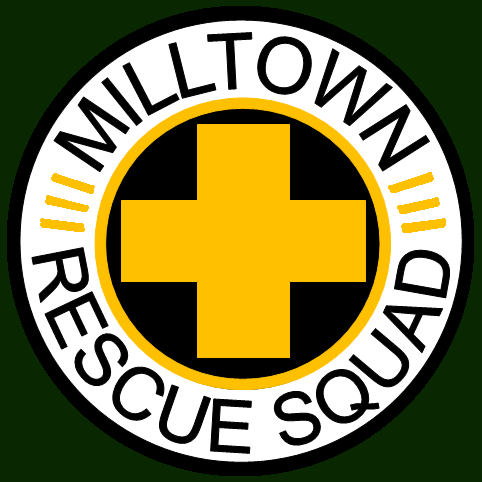 Welcome to the Website for the Milltown Rescue Squad. 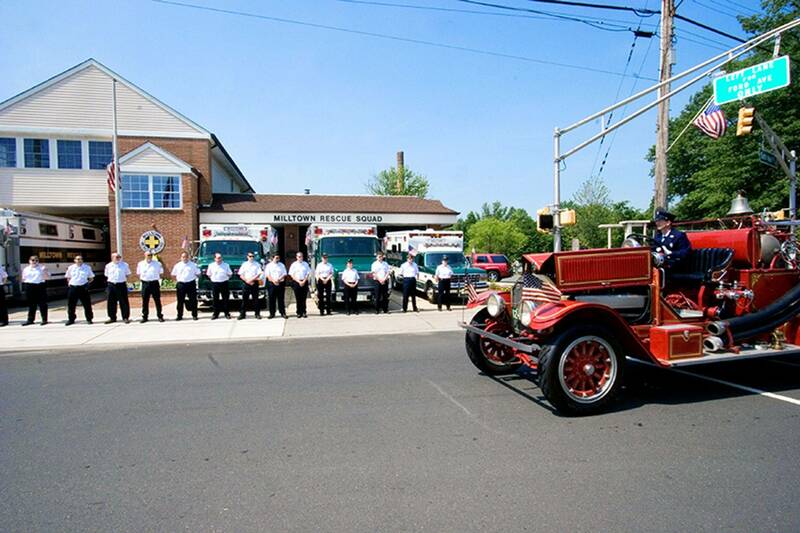 Since 1937, the volunteers of the Milltown Rescue Squad have been tirelessly helping their family, friends, and neighbors whenever they call for help. Everyday, our volunteers take the time out of their lives to help their friends and neighbors in their time of need. None of our members are compensated for the services they provide. Please take the time to browse through our site and learn more about what we do and how you can help. This year marks our 82nd year of service. Please take the time to read our history section to learn about how we have evolved over those 82 years. On behalf of your friends at the Milltown Rescue Squad, have a happy, healthy, and safe day. It's that time of the year again!! 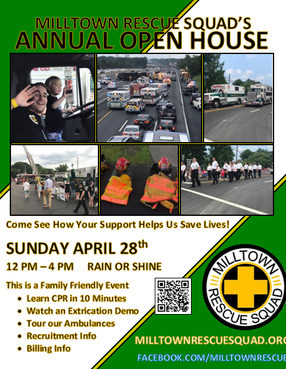 We invite everyone of all ages to come visit your friends at the Milltown Rescue Squad!! As always we are looking forward to a fun filled afternoon! Every year the Milltown Rescue Squad invites the public into our home to learn more about who we are and what we do. This opportunity to give back to our loyal supporters is highlighted with an afternoon of fun and excitment. This year we will be continuing our tradition with an Extrication Demonstration as well as Displays of our Vehicles and Headquarters. Come see how your donations and continued support help us to SAVE LIVES. As with years past, we will have demonstrations of the live saving equipment and training that we use everyday. Information for those who want to learn CPR and First Aid will be available. If you want to do more and feel that you would be a great addition to the squad, applications for those looking to join our family. Learn how to become and EMT and serve your community! 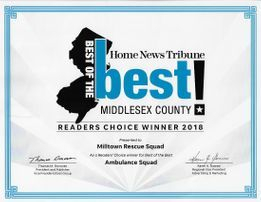 The Milltown Rescue Squad is a non-profit provider of Emergency Medical Services and Heavy Rescue to the Borough of Milltown and parts of East Brunswick Township, including the New Jersey Turnpike. Members of the squad are NJ certified Emergency Medical Technicians and are most importantly volunteers who serve their community. 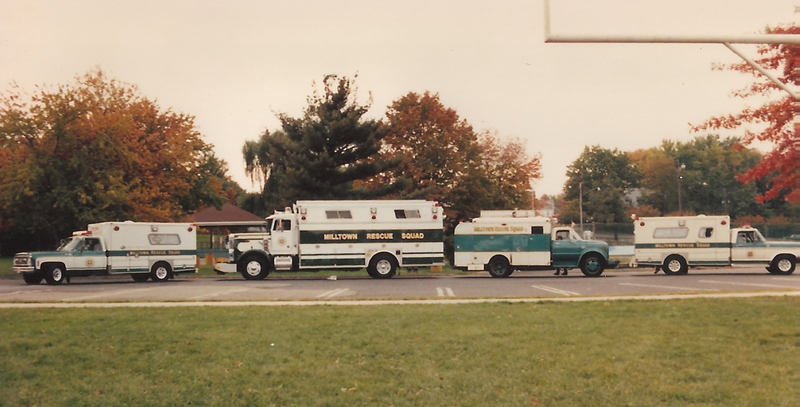 Founded in 1937, the members of the Milltown Rescue Squad have worked tirelessly to provide the best care and compassion possible. The squad relies on the generosity of those we serve to continue our operations and every year we hold our Fund Drive in May as our primary source of revenue. VISIT OUR FACEBOOK PAGE TO RSVP!! 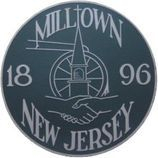 The Milltown Rescue Squad is a NJ Department of Health Licensed Emergency Medical Service organization that serves the Borough of Milltown, and the western portion of East Brunswick Township. We also provide mutual aid services to our surrounding towns in the event they need additional EMS or Rescue resources at any given time. The Squad operates 24/7 and responds to roughly 800 calls per year. 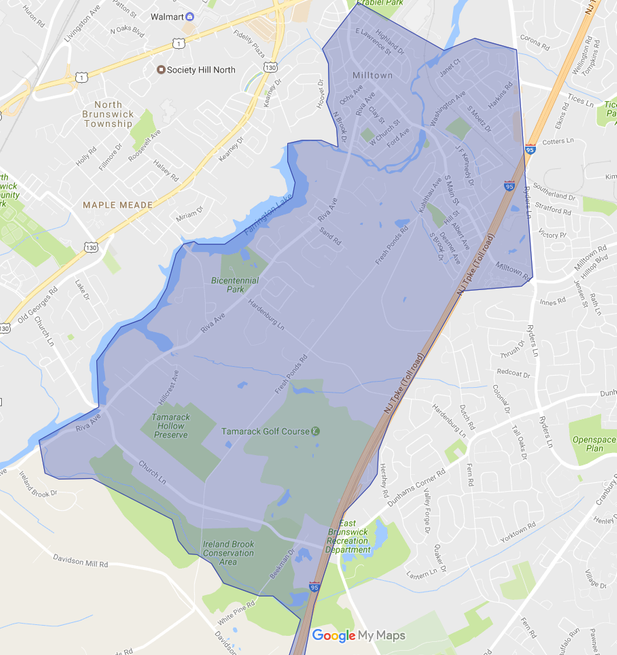 These calls range from Medical Emergencies to Motor Vehicle Accidents to Stand-Bys at community events such as the Middlesex County Fair in August. The Squad is comprised entirely of volunteer members. The only compensation we receive is the joy of being able to help our friends and neighbors in their time of need. Most of our members are New Jersey State Certified Emergency Medical Technicians (EMT). EMTs are trained to provide Emergency Medicine at a Basic Life Support (BLS) level in both medical and trauma related emergencies. Many of our members are also cross trained and certified in extrication, and unlike many other squads, we have to ability to rescue patients who are entrapped in their cars after a serious crash. Other members are certified in Water Rescue, Haz-Mat, Fire Rehab, and as Firefighters. We operate three (3) BLS Ambulances that are staffed with NJ EMTs and AHA First Aiders, who are all CPR certified. Everyone of our ambulances adheres to and exceeds New Jersey First Aid Council Inspection Requirements. Each rig carries the necessary medical equipment such as Oxygen, Cot, Bandaging & First Aid Supplies and carries rescue equipment such as rope, extrication tools, fire extinguishers and much more. Our fleet is not just limited to the traditional ambulance. We also operate a Heavy Rescue Truck, which houses our rescue apparatus such as Extrication Tools, Ventilation Equipment, Rope, Emergency Lighting, and other rescue apparatus that aids us in our duties. In addition, we also have our own specially modified Bobcat Ambulance, which allows us to respond to emergencies in areas that a normal ambulance would not be able to access. We also have a Trailer, which serves as a Rehab Unit for firefighters and other responders, as well as a first aid station at various community events. 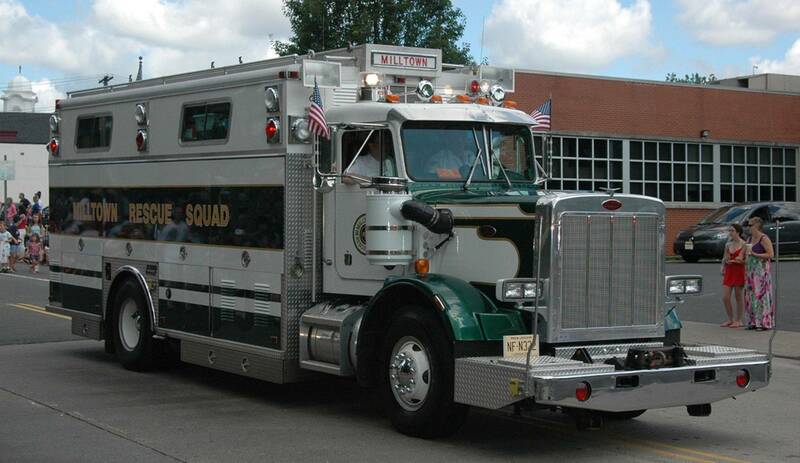 The Squad continuously works with other agencies, such as the Milltown Fire Department and Milltown Police Department, to ensure that you are receiving the best of care.The Squad works with Robert Wood Johnson's Mobile Intensive Care Units (MICU), to provide Advanced Life Support (ALS) in situations that can potentially become life threatening without proper treatment. In times like these, more invasive EMS treatments such as IV administered medicine, respiratory therapy and ECG monitoring are required (i.e. Chest Pains, Difficulty Breathing, CPR, Traumatic Injuries). These units are staffed with New Jersey State Licensed Paramedics who work alongside the Milltown Rescue Squad in specific emergencies. 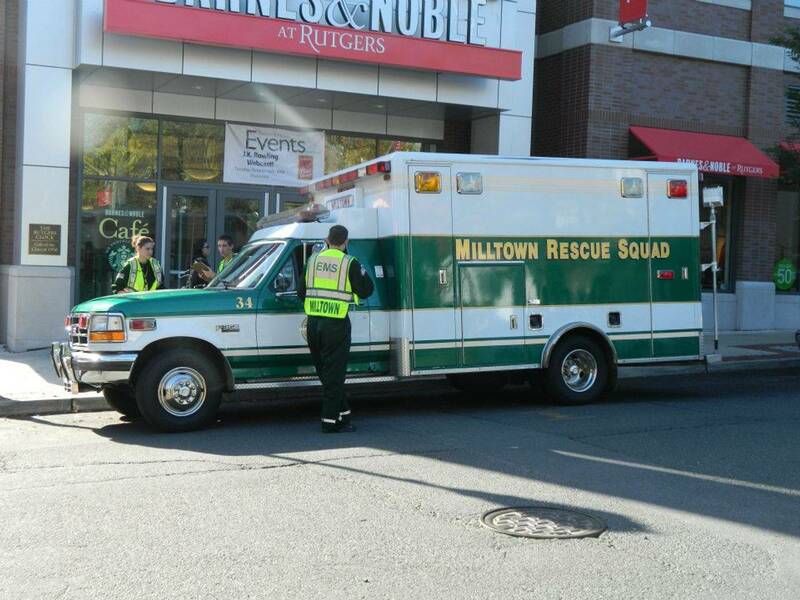 Next time you need help, you can count on the Milltown Rescue Squad to be there. The Milltown Rescue Squad is begining a new program to better serve our community. The Vial of Life program is project that allows EMS to have easy to access vital medical information in your time of need. Participation is simple and five minutes of your time can help save just as much in a medical emergency. Below is a for that you can download. Once printed out, please fill in as many fields as possible. This will allow EMS personel to quickly access information in the event that you have suffered a medical emergency and are unable to communicate with us. Once completed, please post on your fridge in a zip lock bag marked "EMS". Other jurisdictions and agencies utilize similar programs with much success. That vital bit of information can mean the difference between life or death. Please download as many as you need. Thank you for your participation!